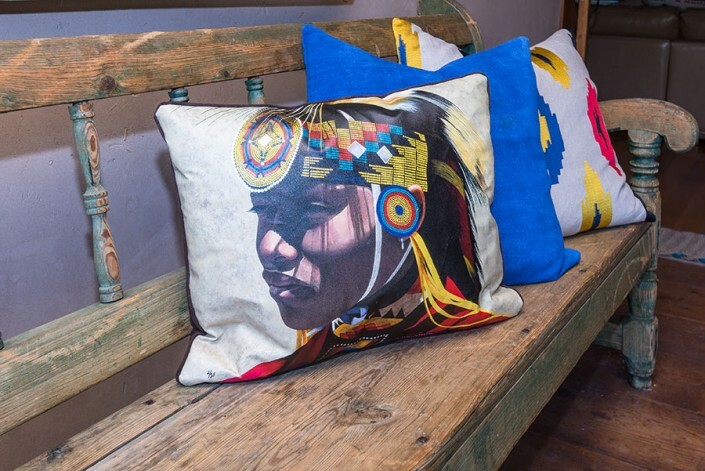 The theme for the 2015 Designer Show House Santa Fe was Luxe New Mexico, re-inventing Western Classics with leather, suede, denim and lace, which was perfect because this significantly historical New Mexico residence, known as the Frank Applegate estate has been re-invented several times. 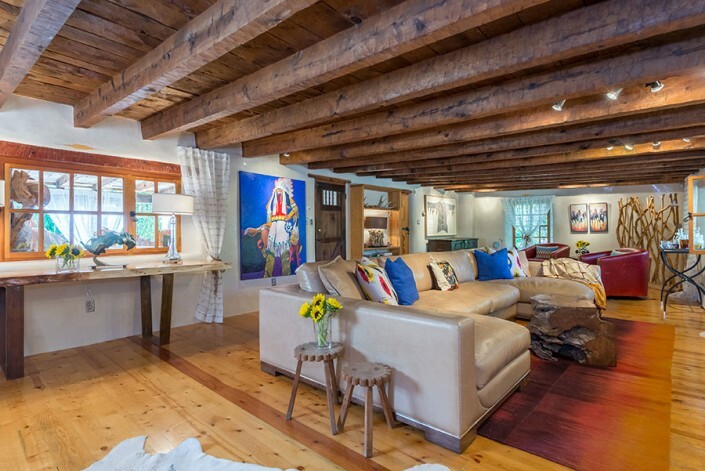 The original structure was built as a fortress in the 18th century. It was purchased in 1845 by Sergeant Francisco de la Pena, a soldier in the Mexican Army who’d fought in the battle of the Alamo. 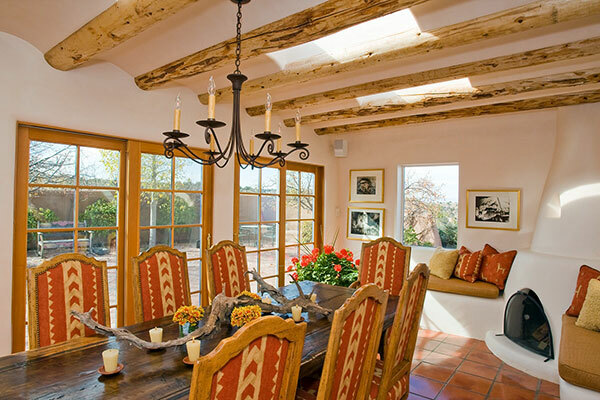 De la Pena renovated the property creating a home for his family. 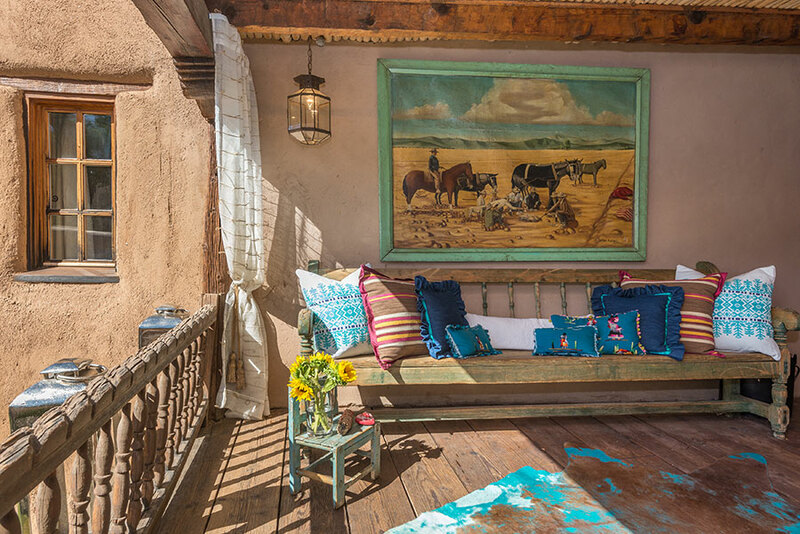 Frank Applegate, an artist from Illinois, inspired by the Cinco Pentores (Santa Fe and Taos’s 5 original young artists) purchased the property in the early 1920’s and created more renovations and additions to the home. Stivers and Smith Interiors designed and re-invented the Library and Sleeping Portal (porch) in this 2015 Show House Santa Fe, Frank Applegate Estate to honor the integrity of the very rich style, history and culture of our great city of Santa Fe, New Mexico while re-inventing the design elements of leather, suede, denim and lace to create a Timeless Luxe New Mexico ambiance within a richly historical environment. 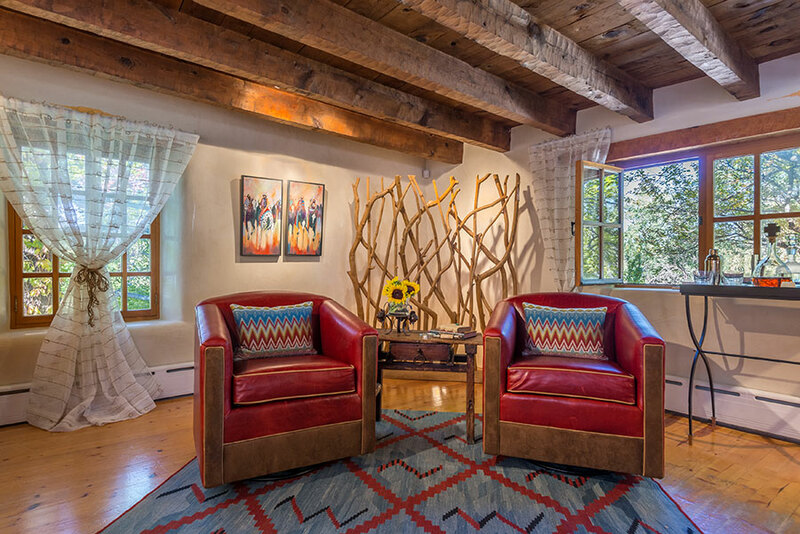 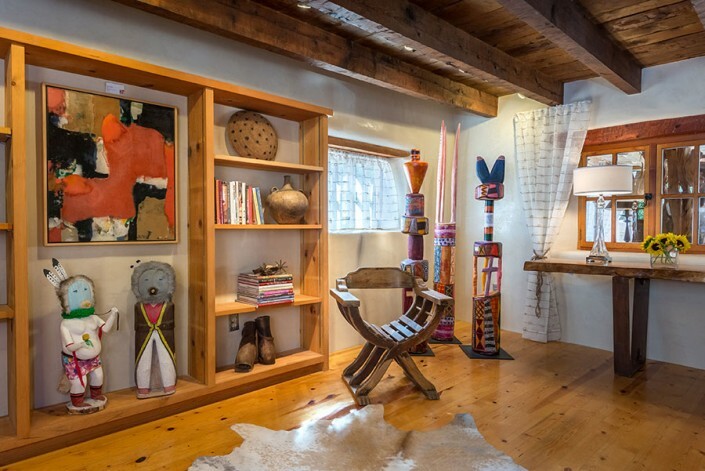 This library in the Frank Applegate Estate, site of 2015 Show House Santa Fe, was designed with an eclectic mix of contemporary organic elements; clean lined upholstered leather and suede pieces and a console from Cowboys and Indians, a store in downtown Santa Fe; contemporary Native American art from the Santa Fe’s Windsor Betts Gallery; southwestern style rugs from The Rugman in Santa Fe; art pillows from M. Moon Designs of Santa Fe as well as various eclectic accents. 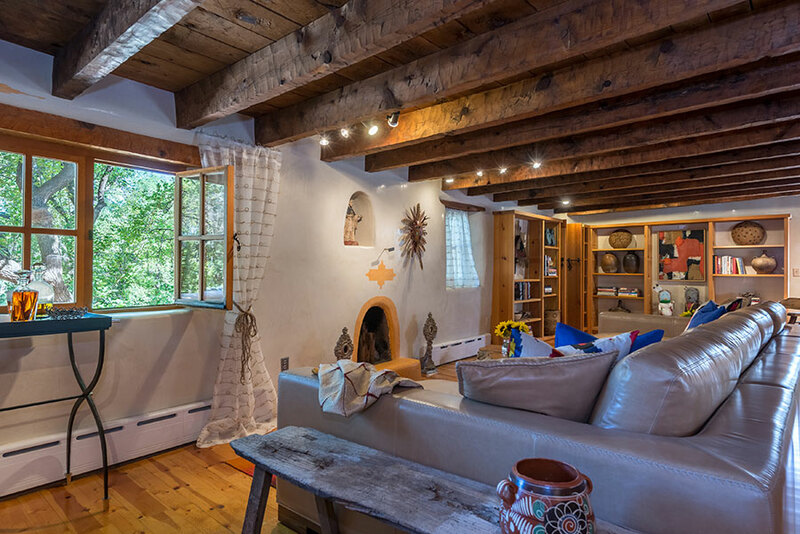 The walls of the library were plastered by Santa Fe’s Fabuwallous and the venetian plaster designs around the fireplace and over the windows was created by Mary McIntyre, a Santa Fe artist . The sleeping portal (porch) in the Frank Applegate Estate, site of 2015 Show House Santa Fe, was one of the more interesting spaces on the property. 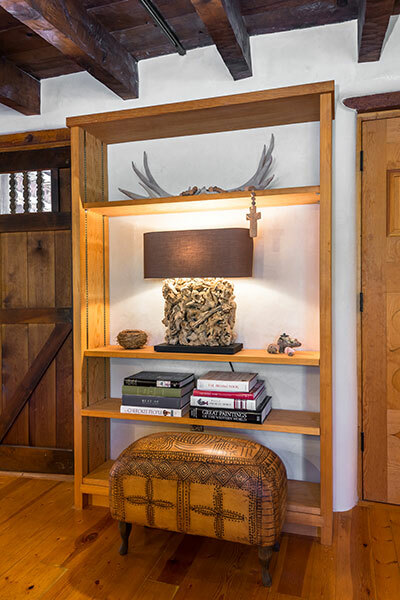 Positioned off the library on the second floor, above the entrance to the house, it overlooked a beautiful entry courtyard. 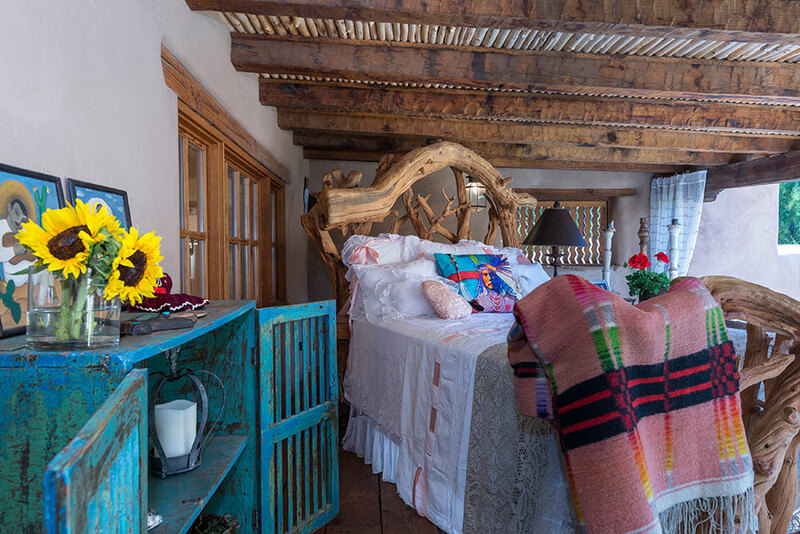 Dating back to the 1920’s, the portal called for a “romantic, dreamy, inviting and over the top” design, capturing the charm of Santa Fe Style. We positioned a fabulous ironwood bed, from Cowboys and Indians in Santa Fe, towards the middle of the portal. 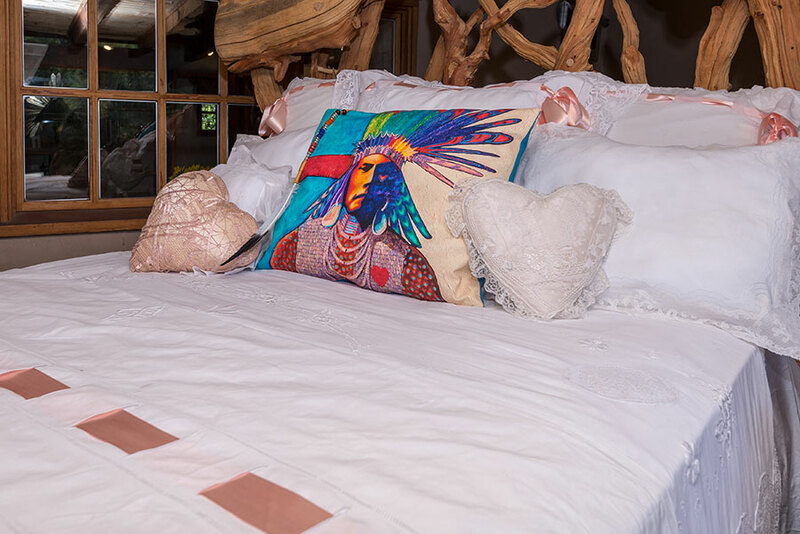 Adorned it with exquisite vintage linens and a Mexican blanket from the Ann Lawrence Collection in Santa Fe who has worked extensively with Ralph Lauren. 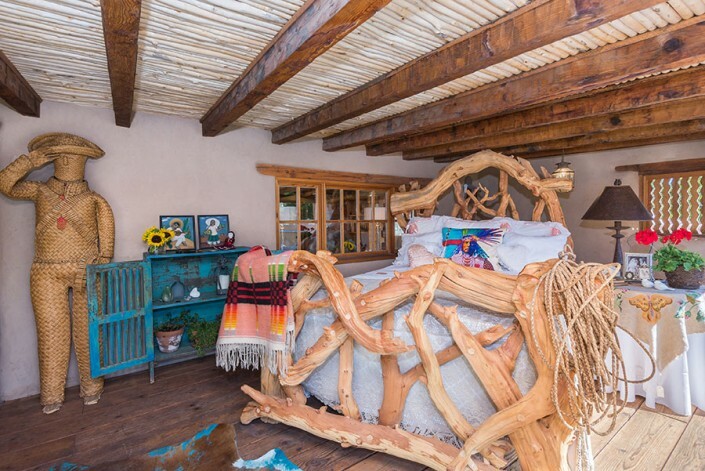 Added old vintage Mexican accent pieces from the Jack Delaney Collection of El Paso Imports, an edgey turquoise cowhide rug from Cowboys and Indians and an art pillow on the bed from M. Moon Designs Santa Fe, all setting the perfect mood for sleeping under the stars on warm summer nights in Santa Fe.